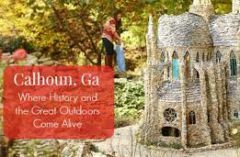 Home // Welcome to Gordon County in Northwest Georgia! Welcome to Gordon County in Northwest Georgia! Welcome! We hope you enjoy your stay with us at the Country Inn & Suites® by Radisson, Calhoun, GA. Available for stays from February 23, 2018 to December 31, 2020. All cancellations must be made at least 24 hours prior to arrival to avoid any charges or fees.